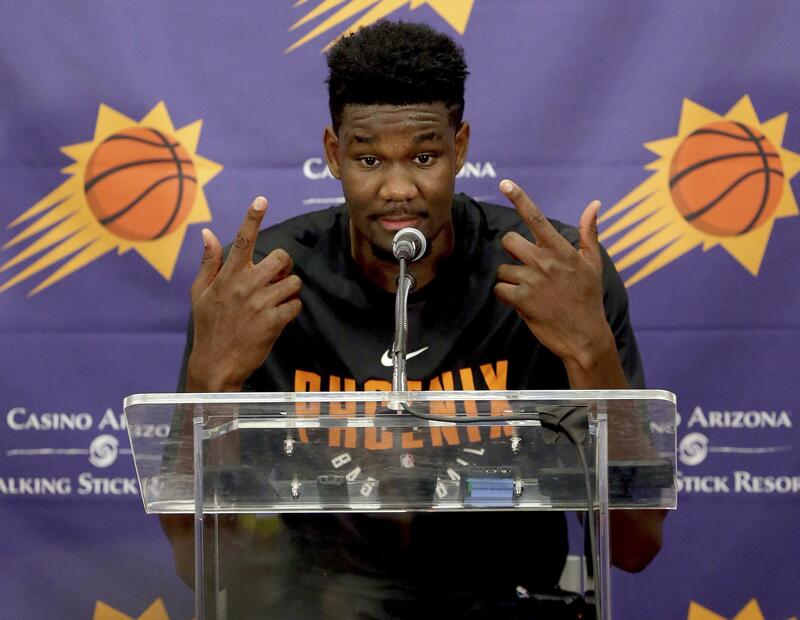 UPDATED: Wed., June 6, 2018, 2:48 p.m.
PHOENIX – Deandre Ayton spent Wednesday with the Phoenix Suns with the feeling that this was the start of a beautiful relationship. The 7-foot-1, 250-pound center went through what he said would be his only pre-draft workout and expressed supreme confidence that the Suns will use the No. 1 overall pick to select him. Not that the Suns have assured him of that, he’s just that confident that the team won’t pass on his combination of size, strength, athleticism and shooting touch. It would be a comfortable fit for Ayton, who was born in the Bahamas and moved to the Phoenix area during high school. He said most of his family now lives here. Ayton played his one year of college basketball a couple of hours down Interstate 10 at the University of Arizona. There hasn’t been much winning in Phoenix lately. The Suns have missed the playoffs eight years in a row and had the NBA’s worst record last season at 21-61, second-worst in franchise history. But there is a young core of talent and most of those players, including Booker and Josh Jackson, watched what Ayton described as “a pretty intense” individual workout. For nearly an hour, Suns coach Igor Kokoskov and his staff put Ayton through a series of game situations, as much as possible given the fact no other players were on the floor. He said there is no current player on which he patterns his game. But he mentioned two pretty good ones from the past. Published: June 6, 2018, 1:39 p.m. Updated: June 6, 2018, 2:48 p.m.